Prošle godine je izašla jedna spektakularno vredna knjiga za sve ljubitelje horora, a naročito za one ozbiljnije, kojiće ceniti činjenicu da je dobila Zlatnog Ghoula (TM) u kateriji Non-fiction! 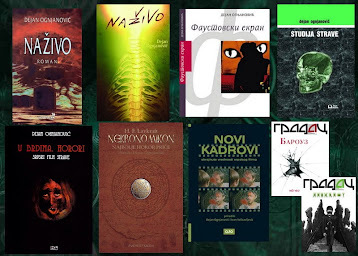 Suprajz, zove se ni manje ni više nego baš HORROR LITERATURE THROUGH HISTORY, a autor ove dvotomne enciklopedije je Mat Kardin (ako znate šta valja, obavezno overite njegov linkovani sajt!). Ladies and gentlemen, make place on your bookshelf for Matt Cardin’s super-ambitious Horror Literature through History, coming from Greenwood this September. 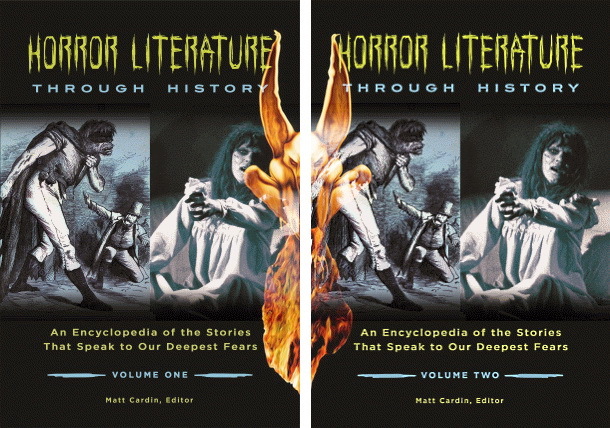 This two-volume monster on over 800 pages is another indispensable reference book on horror literature to place next to your copies of Jack Sullivan’s The Penguin Encyclopedia of Horror and the Supernatural, S. T. Joshi’s and Stefan Dziemianowicz’s Supernatural Literature of the World, Joshi’s Icons of Horror and the Supernatural and William Hughes, David Punter and Andrew Smith’s The Encyclopedia of the Gothic. 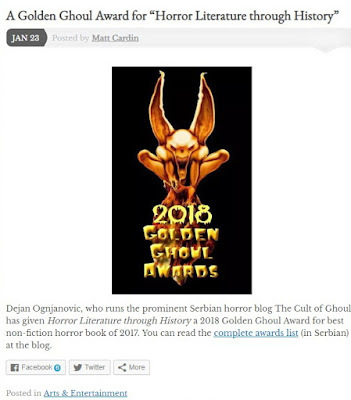 Having already cut his chops editing two reference books – Mummies around the World (2014) and Ghosts, Spirits, and Psychics (2015) – Cardin has set himself a lofty goal with Horror Literature through History; namely, to show 21st-century horror fans the literary sources of their favorite entertainment and the rich intrinsic value of horror literature in its own right. 2) Uopšte nije ilustrovana unutra, samo klot tekst, što je velika šteta. Pored toga, ni dizajn korica nije baš naročito nadahnut niti dobar, a posebno je loša zadnjakorica, koja sadrži reklamu za druga njihova izdanja. Imajući to na umu, i uprkos tome, ovo je odlična knjiga koju, ako ikako uzmognete nabaviti po povoljnim uslovima, ne oklevajte. Evo mog razgovora sa autorom koji je jesenas izašao na sajtu Ru Morga. 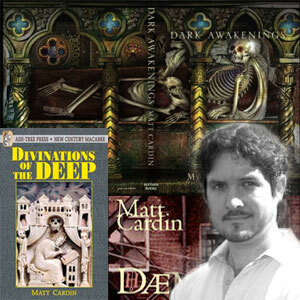 Matt Cardin’s super-ambitious Horror Literature through History has been published recently by Greenwood in two hefty tomes totalling almost 1000 pages. This monster of a book is the subject of Rue Morgue’s print edition article “A Bible for the Horror Fiction Bibliophile” which you can find in issue #178. Matt Cardin was kind to answer a few additional questions exclusively for the Rue Morgue site. - What is the primary aim and purpose of this book? To quote from the publisher’s description, which is of course based largely on text from the book proposal that I submitted to them over two and a half years ago, Horror Literature through History “shows 21st-century horror fans the literary sources of their favourite entertainment and the rich intrinsic value of horror literature in its own right.” In other words, it’s meant to serve as both a general reference work about the history of horror literature and a book that can educate people about the literary backgrounds of what might be called “screen horror”: horror movies, horror television, horror video games. Horror’s popularity right now is just off the charts. This seems likely to continue for a long time. And with the bulk of that popularity falling in the realm of screen horror, there’s something fundamental, something crucial, in the fact that there’s a literary background or precedent or forebear to virtually every monster, plot, theme, and idea that’s in play right now on screens everywhere, large and small. 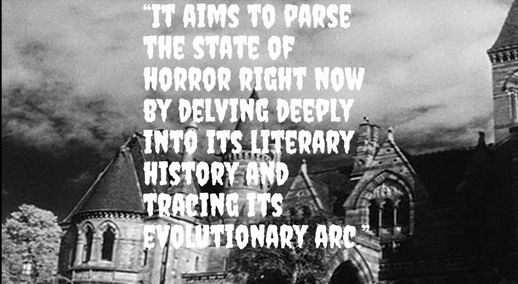 Plus, the literary side of horror itself is presently undergoing a kind of revolution. Weird fiction, for instance, has begun to evolve in striking new directions. The Internet has given rise to things like creepypastas. So the book is aimed at all of that. 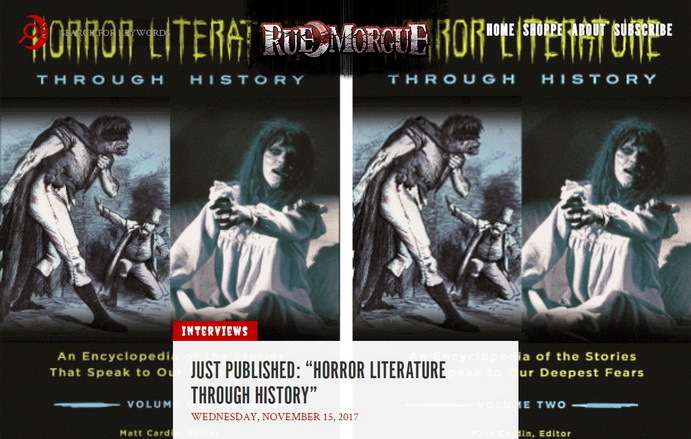 It aims to parse the state of horror right now by delving deeply into its literary history and tracing its evolutionary arc. - How hard was it selecting the topics, names and works which should be included or discarded? And what criteria were used for either selecting or discarding one? That was one of the most difficult parts of the whole project. I had a much longer list than what eventually ended up in the final version, and it really hurt to cut out some of those items. I made my decisions based on careful research combined with a personal sense of who and what is significant enough to warrant a slice of precious page space in such a project. I also relied on the judgment of my contributors. There will no doubt be people who will disagree with some of the inclusions and exclusions, and that’s as it should be, since so much of a decision process like this ends up being a matter of subjective judgment. I think it may prove especially slippery when it comes to the inclusion of some contemporary authors who in historical terms have only just begun to make their mark. But that said, I felt confident in my decision to include stand-alone entries on Mark Samuels, Joe Hill, Laird Barron, Michael Cisco, Brian Keene, and Reggie Oliver. Then there’s the fact that the first two sections of the book provide space for discussing a very wide range of authors, books, stories, poems, and topics that aren’t included as separate entries in the final reference section. For example, the writer of the entry “Horror in the Twenty-First Century,” a scholar at the Manchester Centre for Gothic Studies named Xavier Aldana Reyes, devotes a paragraph to Adam Nevill. He also mentions a host of worthy additional authors who don’t have their own separate entries, including Sarah Pinborough, Nicole Cushing, Sarah Langan, Tim Lebbon, Simon Strantzas, Richard Gavin, John Langan, Quentin S. Crisp, and Livia Llewellyn. I myself used the master timeline of literary horror history that appears near the beginning of the book to give mention to a few worthy items that aren’t mentioned elsewhere, such as Jonathan Padgett and his remarkable 2016 horror collection The Secret of Ventriloquism. So this is all to say that the encyclopaedia covers a vast swath, even given the necessity to make strategic decisions about inclusion and exclusion. You really can’t grasp the extent of its coverage without actually getting hold of a copy and browsing through it. - What is the definition of Horror Literature which you used in this book as your guiding principle? Horror literature is any work of imaginative writing that hinges centrally on this feeling, this heady subjective state that is part mental/emotional and part physiological. Horror literature is the type of literature that dwells upon and within the dreadful—as in dread-filled—aspect of life and the world. It refuses to look away from that which makes us want to. And I think the most profound and important is that such literature will always be the kind that doesn’t try to do this for mere entertainment value or shock effect, but for the purpose of conveying something that the author has personally known in his or her own life. So I suppose this harks back to your question about my criteria for choosing what to include and exclude in the book. In most cases I was using this understanding of horror as a backdrop for my editorial decisions. - The book is very wide-ranging in terms of time (starting with the Ancient World onwards); is it as wide-ranging in terms of space, i.e. the whole world, or is it mostly Anglo-American-centric? In other words, did you try to make it more wide-ranging and if so, what were the obstacles? The overall focus is on Western civilization, with the bulk of the attention going to British, European, and American horror. But here are many references to other traditions and parts of the world as well. For instance, the essay “Religion, Horror, and the Supernatural,” by literature and film scholar Eleanor Beal, has included a sidebar titled “Religious Horror around the World” that provides some information on Asian horror, Islamic horror, and American Jewish Gothic stories. So there’s a global aspect to it, even as the main focus is on the West. - Where do you see this book in comparison to somewhat similar ones, like The Penguin Encyclopaedia of Horror and the Supernatural? Or perhaps you had some other title as your guiding ideal in shaping the contents and ambitions of this book? The Penguin encyclopaedia is such a beautiful piece of work, and also such a seminal one. I cherish that book. But I didn’t have it in mind as I was working on this one. (Interesting side note, though: Several of the people who wrote for that book so many years ago came aboard to write for this one.) To be honest, I really didn’t have any other book in mind, although in my submitted proposal I compared and contrasted it with such items as S. T. Joshi’s and Stefan Dziemianowicz’s Supernatural Literature of the World, Joshi’s Icons of Horror and the Supernatural, William Hughes, David Punter, and Andrew Smith’s The Encyclopaedia of the Gothic, and Jerrold Hogle’s The Cambridge Companion to Gothic Fiction. (Another interesting side note: Joshi, Dziemianiowicz, Hughes, Punter, and Hogle all contributed to Horror Literature through History.) Along with creating that unique three-part structure, the basic point for the encyclopaedia at hand was to make it more current than any other of its kind. Now, currency is a sliding scale, of course, so the march of time will eventually remove that edge. But I do think this project is the first of its kind to formally recognize the significant new vanguard of horror lit as it advances toward the middle part of the new century, and to place this within the context of the deep history that preceded it. It’s the first to start reconciling the epochal shifts and impacts of the Internet and the digital media revolution with this venerable literary tradition that has now spun off into multiple non-literary forms, each of which owes a debt to its literary forebears. It’s the first general reference work of its kind to deal with horror literature as it relates to the profound cultural tensions and conflicts, and the attendant shifts in perspectives, that have characterized these early decades of the twenty-first century. In short, it’s unique in its relevance to horror’s unfolding twenty-first century state and status, with all of that fascinating literary history bristling in the background of the current boom and extending centuries and even millennia into the past. As I said, it has been a personally meaningful and deepening experience for me to edit this project, and I think and hope it will provide some of the same to its readers. polako, to je tek za 8 dana... ne znam ni da li ću stići od drugih obaveza... potrudiću se ali neće to biti pre iduće subote. if at all.